Seemingly random bits of e-waste make up the Ore Streams collection of office furniture, designed by Italian duo Formafantasma. 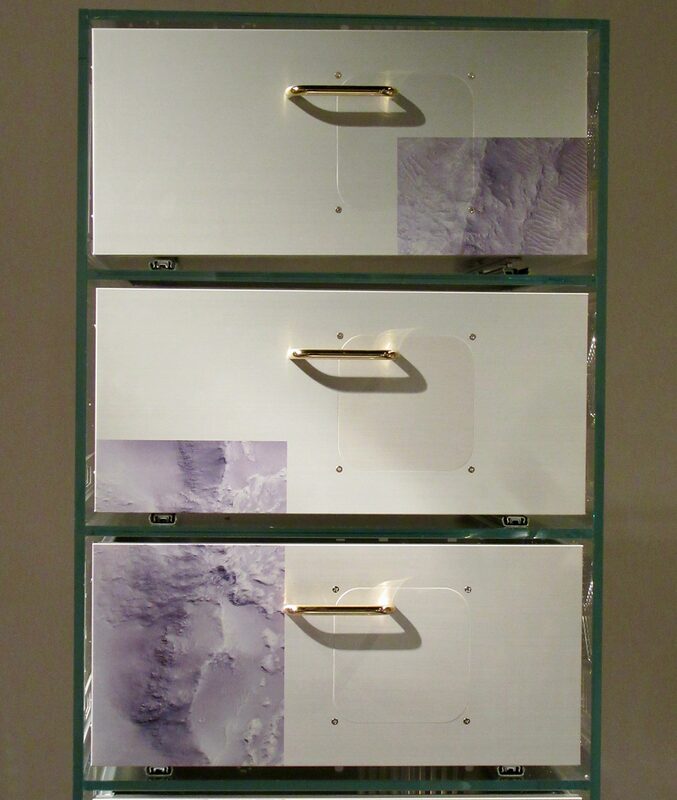 Cabinet (2017) is a clear glass-encased filling cabinet created from up-cycled aluminium computer cases embellished with a digital print of the surface of Mars, a reference to the extra-terrestrial origins of gold, which is widely thought to have arrived on earth via a meteorite shower. 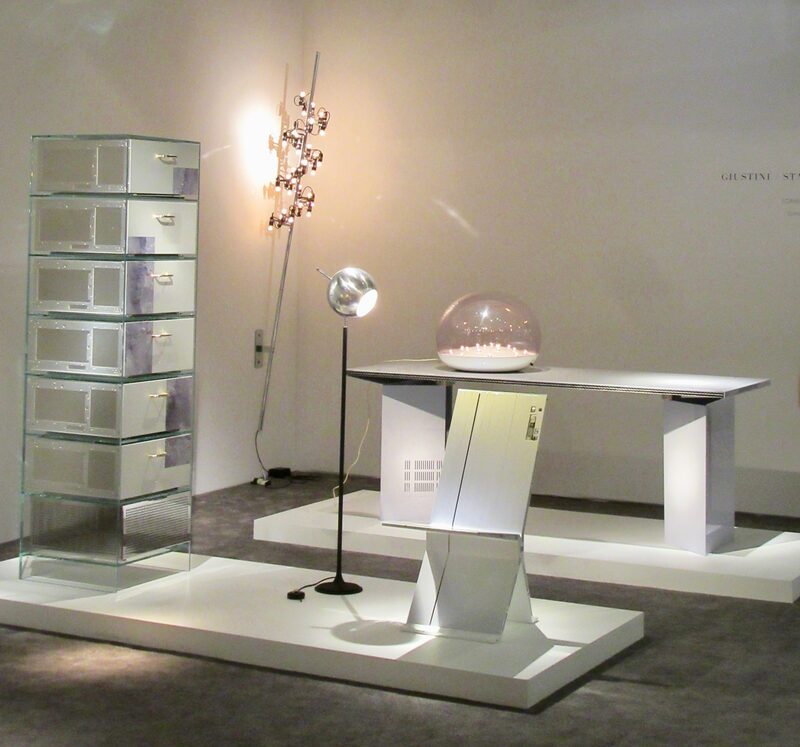 Formafantasma’s Andrea Trimarchi and Simone Farresin created cabinet and accompanying furniture series as part of their Ore Streams project, a two-year study into the current state of electronic waste recycling that proposes new approaches for designers working on gadgets. 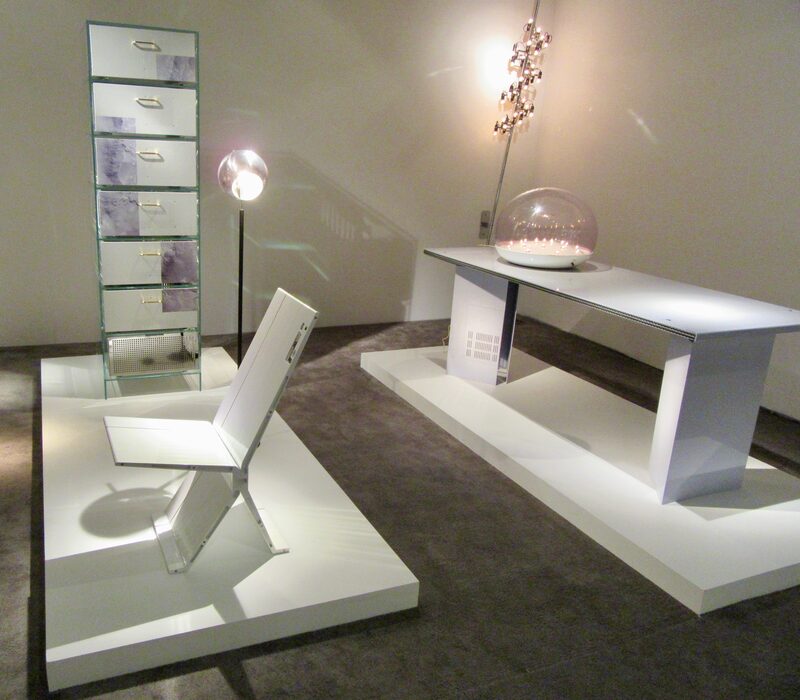 The furniture is designed as a poetic response to the findings. 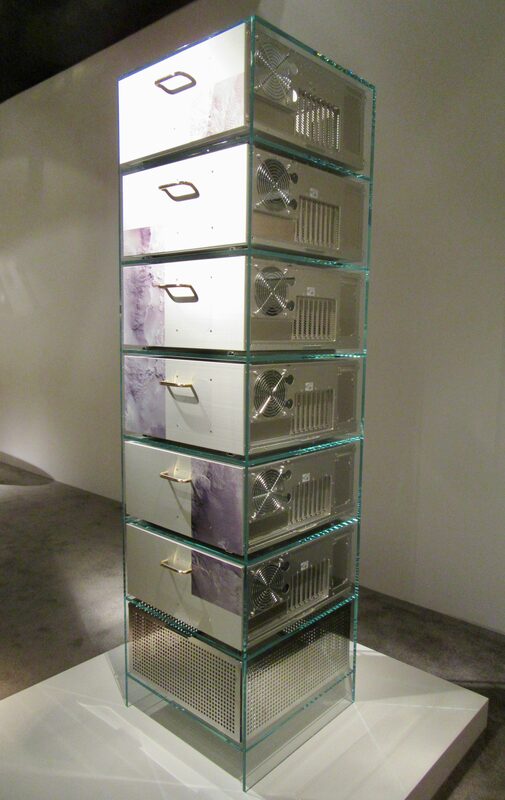 The pastel-hued metallic objects incorporate decontextualised bits of electronic waste, like the casings from iPhones and laptop keyboards. 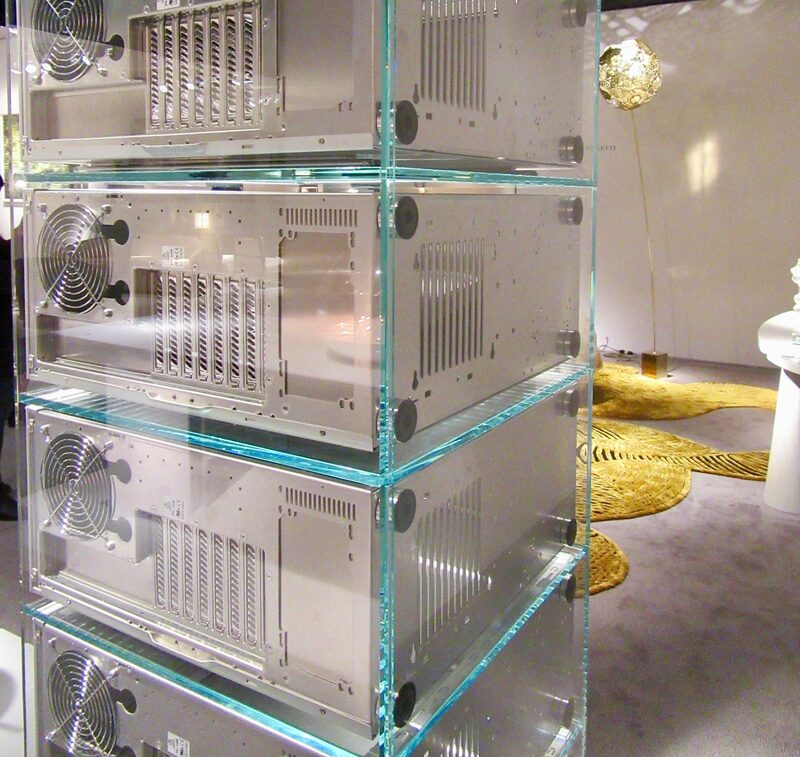 One cubicle features a pigeonhole formed from a microwave, while a rubbish bin is lined with gold scavenged from circuit boards. The duo chose objects that were familiar within the office, but made them slightly odd and unfamiliar. In addition to the filing cabinet, the collection includes a table, rubbish bin, two cubicles, a desk, chair, lamp and shelf, all made primarily of dead stock. 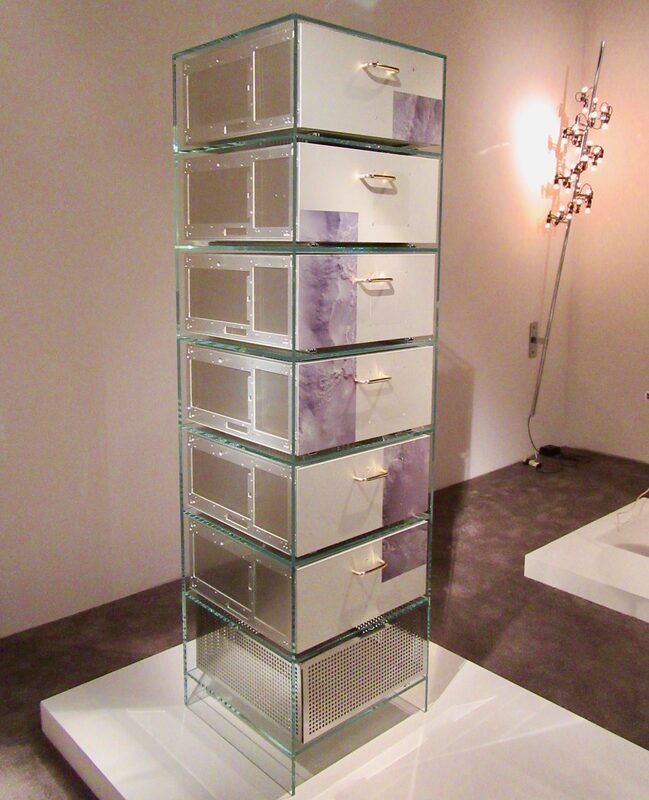 Photographed in the Giustini / Stagetti Booth at the Salon Art and Design, at the NYC Armory in November of 2018. 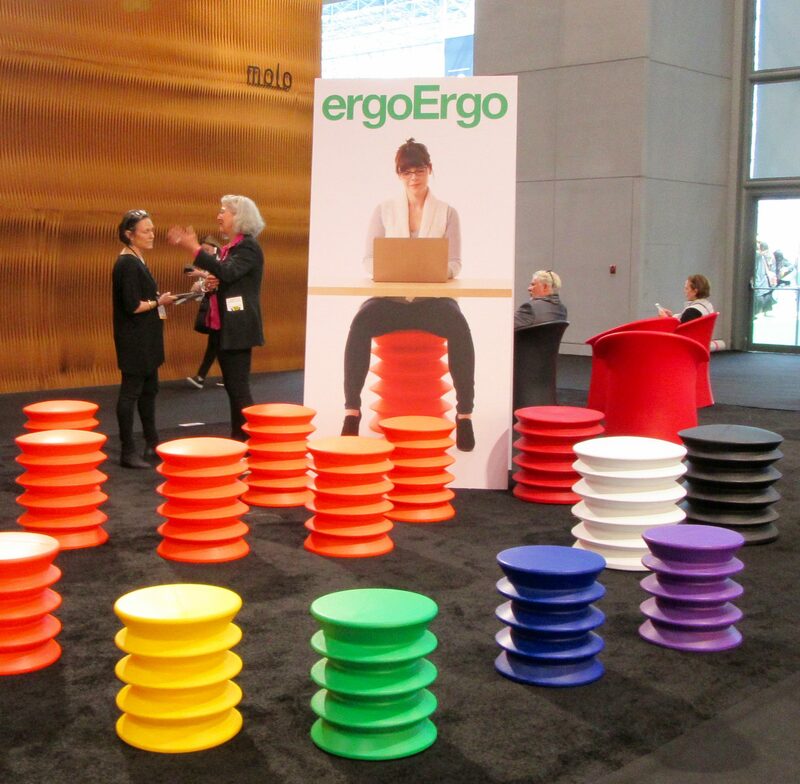 Eye On Design: ergoErgo Seating! 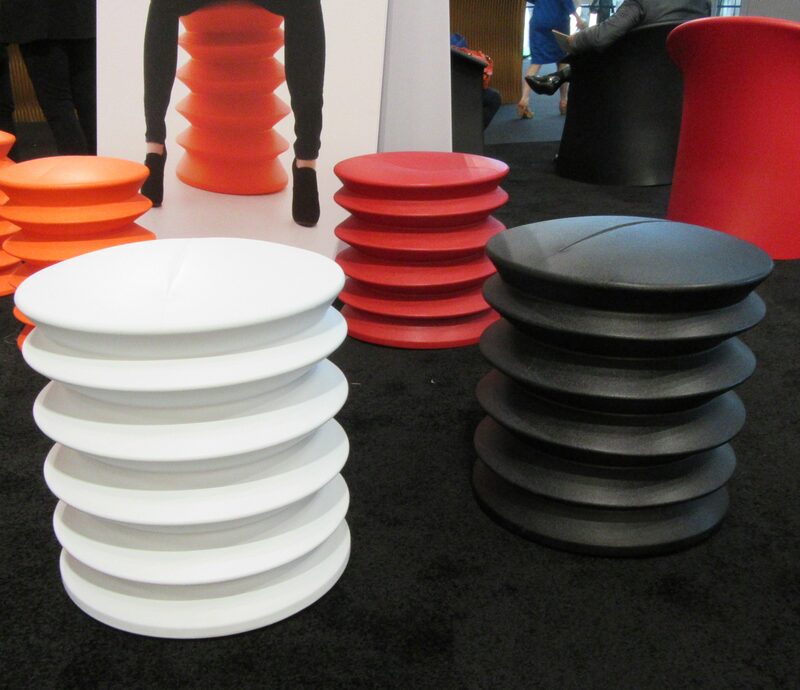 Ergonomic seating has been a hot ticket item for decades now; but the ways in which designs continue to evolve keeps the field exciting and on trend! 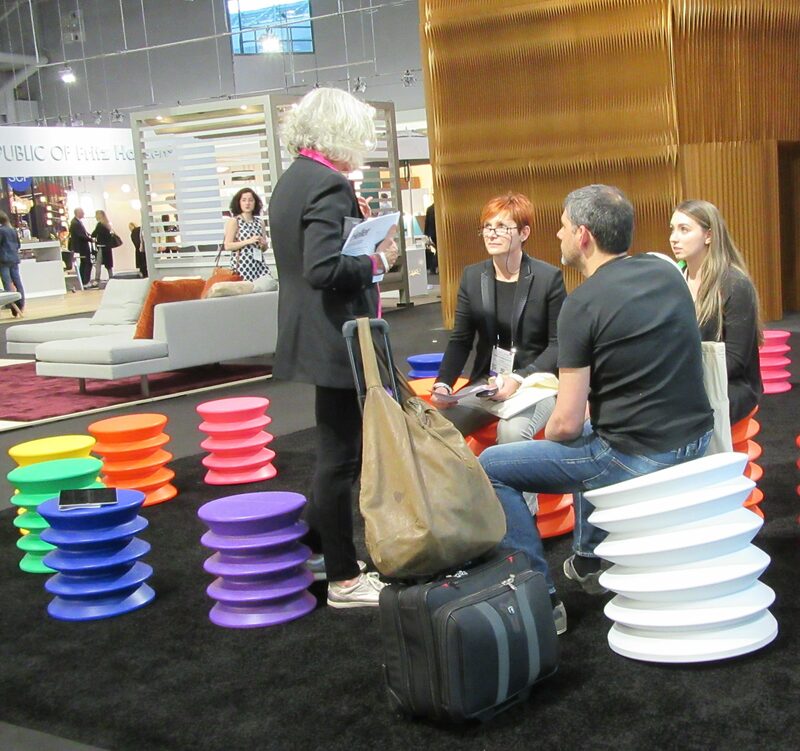 At ICFF 2017 we fell in love with the ergoErgo office seating, not only for its funky and functional modern design, but for its availability in a spectrum of vibrant colors to please a range of personal tastes! 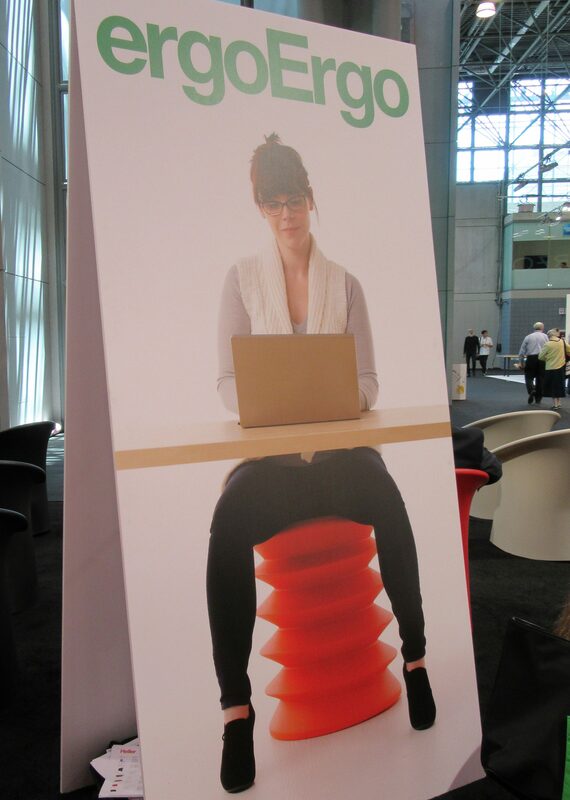 The ergoErgo chair invites you to sit dynamically. Evolution designed us to walk and run, to chase prey across the plans, to stalk in the forest, to crouch around a campfire. But to sit rigidly in a chair for extended periods of time? Not so much. Our bodies were made to move! Traditional chairs make our muscles passive and weak by locking the body into a rigid position. Today’s worldwide epidemic of aching backs, sore shoulders, and stiff necks is caused in great part by poor by sitting. People slump and slouch on rigid chairs in offices and classrooms. Many think that they have to live with a ‘bad back,’ but often they just need to sit correctly. When you in on an ergoErgo chair, you shift through a whole range of large and small movements. Your breathing deepens. Your blood circulates freely. 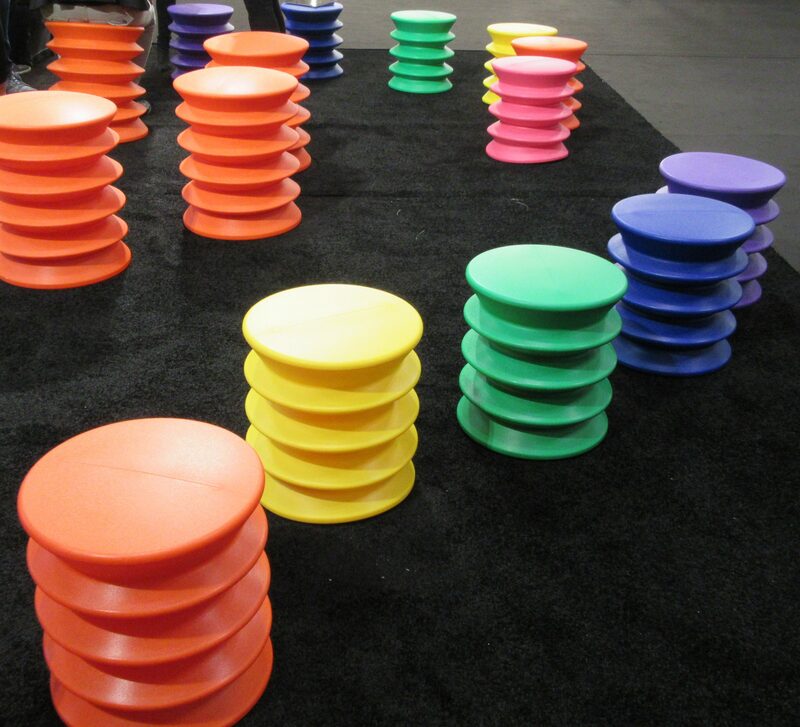 Your spine twists gently, bringing fluid to the inter-vertebral discs. The abdominal muscles keep the body upright and supple. Replacing even your considered-to-be ergonomic office chair with ergoErgo not only strengthen your core, but it will also awaken your mind. ErgoErgo is intelligent design that every body can benefit from. Available in three sizes to fit both kids and adults, ergoErgo has won both the Edison Award and the Good Design award! And best of all, it retails for around $100! Find out more about ergoErgo at This Link!